“72 Kilograms of tinned tomatoes are the main ingredient in tonight’s dinner”. For one afternoon I volunteered to work in the galley – the ship’s kitchen. 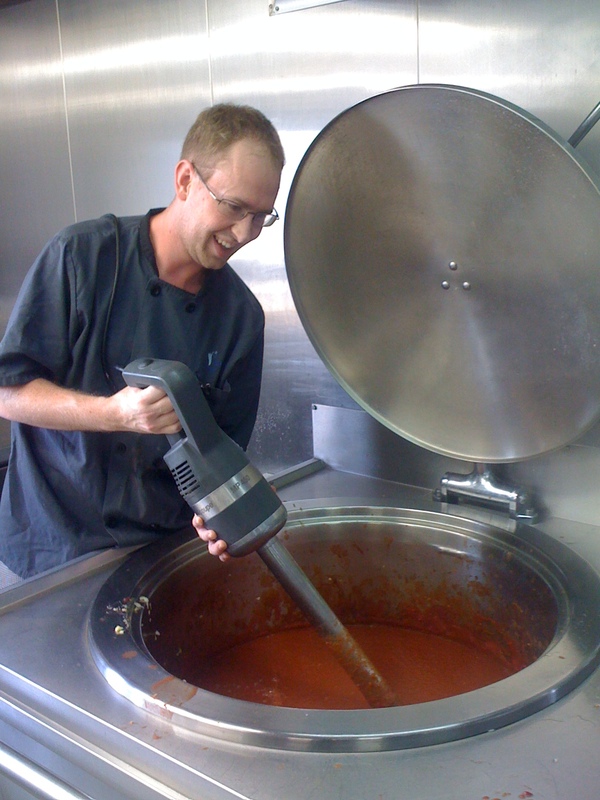 Food is cooked in large amounts and served buffet style to the ship’s crew, so amazing amounts of food such as 30 tins of tomatoes, giant boiling pots and power tools for mixing come in to play. The end result was pasta with tomato and meat sauce which the crew enjoyed – and nobody got sick! Volunteering in the galley was my way of pitching in to give others some time off during Sabbath week on board Logos Hope. Every year, the ship’s crew takes a week out from our busy schedule to reflect, recharge and reconnect with God and with each other. Since the ship is closed to the public, those who work in events, book fair and office jobs will work in other departments to spread the load and give everyone some needed rest. During this week I have really learned the value of forgiving and loving other people. We are a community of Christians from over 45 different nations working together to bring in the harvest. If we work as individuals we will ultimately fail in both our purpose and our example. I have identified people whom I have forgiven – the next step for me is to approach them and tell them.